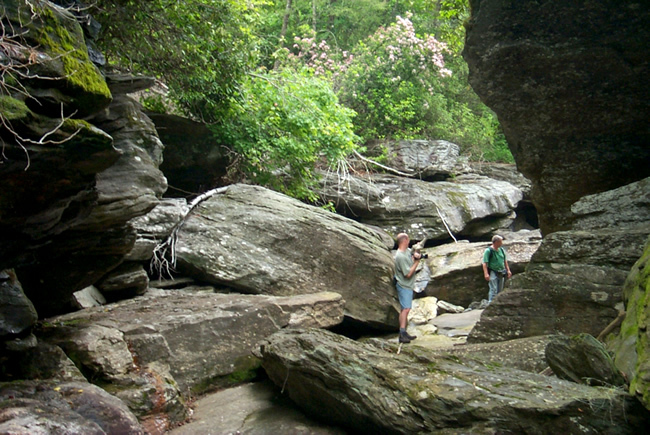 Massive displaced boulders at “Bonas Defeat” near the headwaters of the Tuckasegee River, Jackson County, N. Carolina. The massive size of these boulders is stark evidence of the colossal scale of ancient floods. 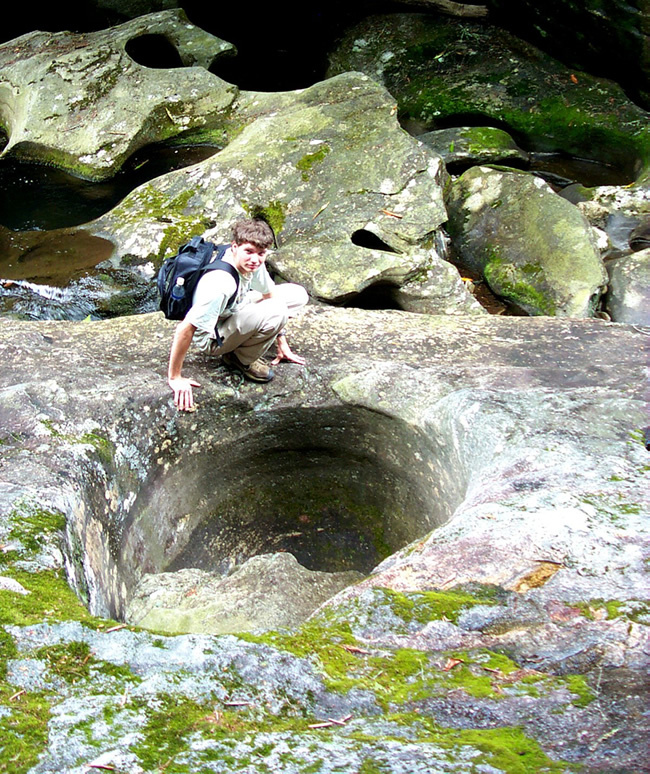 Enormous potholes drilled into bedrock provide further evidence for megascale turbulence. No modern floods have equaled in size or power these ancient cataclysms. Many other creeks and watersheds throughout the southern Appalachians also display such evidence. Other examples will soon be documented on this website. Here is an example of one of the many potholes of all sizes found along the headwaters of the Tuckasegee River. This pothole is nearly six feet in diameter. Other potholes can be seen in the rocks beyond. Observing the size of the present current flow it should be obvious that it would be wholly incapable of drilling a hole such as this, even during short lived flash floods. The conclusion seems inescapable that the flood, or floods, that created this pothole also displaced the hundreds of massive boulders scattered chaotically up and down the creek channel. 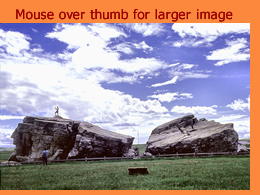 In the previous featured picture we discussed Okotoks, or ‘Big Rock’, a giant erratic boulder found in the eastern foothills of the Rocky Mountains in Alberta. We argued that the boulder was emplaced by an iceberg carried in the waters of a catastrophic meltwater flood. 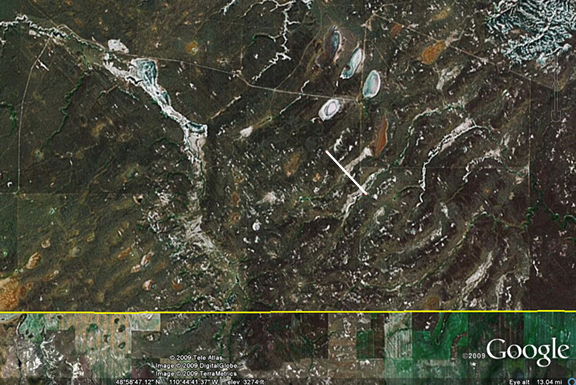 This week we show you a Google Earth photo of the Milk River current ripple field which straddles the Alberta/Montana border at latitude 49 degrees north and longitude about 110 degrees 45 minutes west. We would argue that this set of enormous ripples was the product of the same flood flow that deposited Okotoks. The white bar diagonally across the field of view is one mile in length. You can clearly see that the wavelength of the ripples is on the order of 1,500 feet. These are truly extraordinary features and imply a current flow of colossal magnitude. 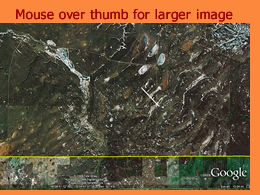 The altitude of the image is 13 miles. It is likely that these ripples are a product of the great subglacial flood usually called the Livingstone Lake event by John Shaw and others. 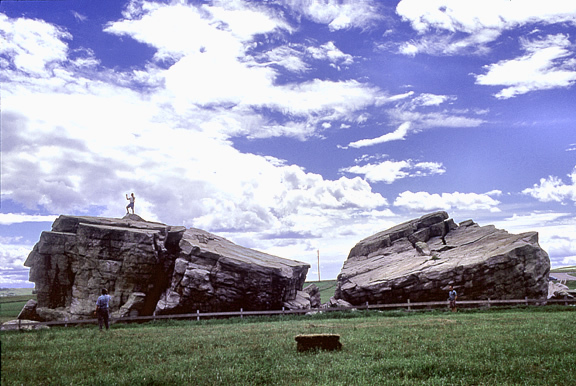 Okotoks, which means “Big Rock” in the language of the Blackfoot Indians has been claimed to be the largest glacial erratic in North America. Its approximate dimensions, if reassembled as a unit would be approximately 135 ft x 60 ft x 30 ft, with a weight of some 18,000 tons. It is composed of quartzite rock and is but one of hundreds of lesser boulders of similar composition reaching in a train from the Athabasca River near Hinton, Alberta, at the northern end, to the Montana border and beyond on the southern end. The entire length of this Foothills Erratic train, as it is called, is some 350 miles. Okotoks is over 120 miles removed from its bedrock source. While it would be difficult to find an erratic of greater size than Big Rock, we would submit that neither it nor the other members of the Erratic Train are, in the usual sense of the word, glacial erratics. The problem was noted by geologist G. S. Hume back in 1931 when he commented “These blocks must have been transported long distances from the west. It is difficult to understand, if ice was the transporting agency, why the blocks and their occurrence would not be broken up and strewn over a wide area.” (Hume, G. S. “Overthrust Faulting and Oil Prospects of the Eastern Foothills of Alberta between the Bow and Highwood Rivers”; Economic Geology, vol. 26, pp. 258-273) Let us consider the circumstances. This massive boulder of quartzite is found about 20 miles south of the town of Calgary, in Alberta, Canada, in the eastern foothills of the Rocky Mountains. Its source, according to most researchers, appears to be in the vicinity of Mt. Robson Provincial Park in British Columbia, most likely from Mt. Edith Cavell. As will be apparent from studying the photograph of Okotoks, it is now lying in three large pieces, which were at one time connected as a single unit. In fact, from the position in which it now lies it would appear that it separated upon being deposited where it now lies. It would be extremely unlikely, if not impossible, that detached pieces could have been transported over 120 miles within glacial ice and not have become widely separated in the process. The great rock has sunk into the substrate and most likely broke at that stage in its journey. The form of the rock is not typical of a glacially transported rock. Note, in the photograph, the sharp edges and squarish corners; in the case of a typical glacial erratic the edges and corners would have been ground off during transport. Additionally, there are no glacial striations observed on any of the erratics. The inevitable conclusion as to mode of transport was proposed by geologist R. L. Rutherford in 1941, when he commented: “In the opinion of the writer, these large erratics all came from the Waterton Lakes district. They apparently were transported a short distance by mountain glaciers, but their chief mode of transportation was by floating ice in bodies of water…Their sizes and shapes seem to preclude any long distance movement within moving ice.” (Rutherford, R. L. “Some Aspects of Glaciation in Central and Southwestern Alberta”; Transactions of the Royal Society of Canada, sec. 4, pp. 115-124) The idea of iceberg rafting was further supported by the work of C. Warren Hunt with the publication of two articles in the Canadian Bulletin of Petroleum Geologists in 1976. It would therefore appear that Okotoks, along with the rest of the Erratics, must have been loaded onto the surface of a glacier near their source, that the glacier subsequently broke up as icebergs into a meltwater stream and were carried in the meltwater currents until they eventually came to ground in a north-south line along the Rocky Mountain foothills. The iceberg carrying Big Rock floated in the glacial meltwater stream until it came to ground at the present location of Okotoks and, upon melting, deposited the great boulder where it now lies. The magnitude of the meltwater stream can be gauged by the size of the iceberg necessary to float an 18,000 ton boulder. Rutherford, in the same article quoted above calculates the volume of such an iceberg to be on the order of 5,500,000 cubic feet. As an example, this volume of ice would translate into an iceberg the size of a football field with a thickness of 115 feet. Obviously a flow sufficient to float such an iceberg would have to be considered catastrophic. The best estimates as to the age of the Erratics Train place its origin during the Late Wisconsin, that is, as part of the great meltdown of the North American ice complex which occurred between 13,000 and 11,000 years ago. From the vantage point of Earth there are two types of lunar terrain clearly visible at the time of the full Moon. 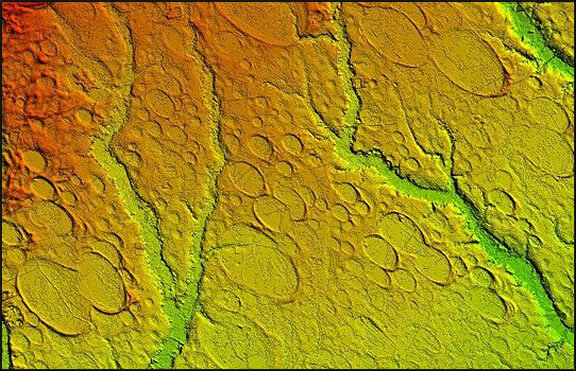 There are large dark, relatively smooth splotches that contrast conspicuously with the lighter colored, more reflective terrain. The lighter areas are generally topographically higher than the dark colored areas and are therefore referred to as the lunar highlands, although the term continents is considered more appropriate by many astronomers. They are also much more densely cratered than their less reflective counterpart. The darker areas are called maria, from the Latin word for “seas” and they are much smoother and less densely cratered than the highlands. The contrast of dark and light is what creates the impression of a face often referred to as the “Man in the Moon.” Other cultures had alternate interpretations for the pattern. Many Native American cultures, for example, imagined a rabbit, or hare, depicted in the lunar terrain. 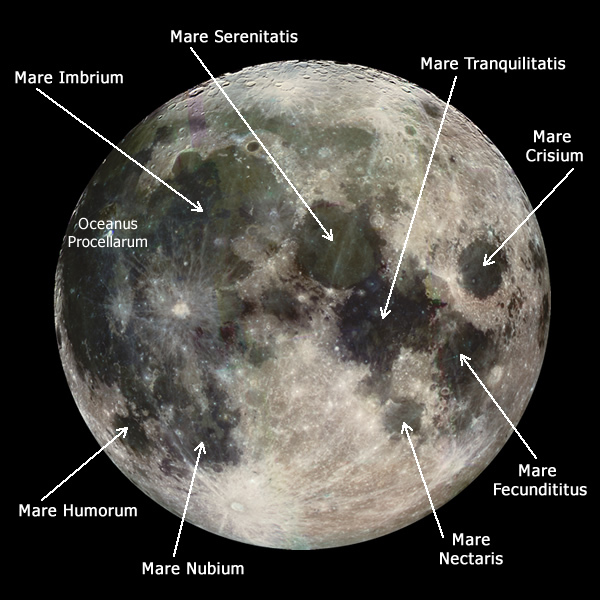 As this image shows several of the maria, such as Mare Imbrium, Mare Serenitatis and Mare Crisium are obviously circular in shape. 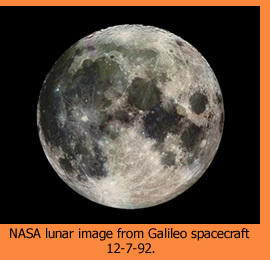 This has led to the conclusion that they are formed as the result of giant impact events early in the Moon’s history. While this interpretation must certainly be correct, the maria have features which are difficult to explain. For one thing, they are extremely shallow for their size. A typical diameter to depth ratio in a matrix of density equivalent to that assumed for the lunar crust should be about 6 to 1. Mare Imbrium, for example, is almost 600 miles in diameter. This would suggest a depth of many dozens of miles instead of the three or so miles when measured relative to the mean lunar surface. Their shallow depth would seem to indicate an extraordinarily rigid crust. The dark material filling the maria is similar to terrestrial basalt. It could be assumed that this is the result of impact produced lava filling the craters subsequent to formation, yet radiometric dating indicates that the lava is much younger than the depressions which they fill. In addition, there are, at the center of 5 of the large nearside maria strange buried objects called mass concentrations, or mascons, for short. They were first discovered because they were so dense compared to the material surrounding them that they actually deflected lunar orbiters in their flight paths around the Moon. One study on their gravitational effects led to the conclusion that a rough equivalent of the mascons would be a buried mass of nickel iron about 60 miles (100 km) in diameter. Considering that the overall density of the Moon is quite low, about 3.34 grams per cubic centimeter, slightly more than half that of the Earth, the mascons should long ago have sunk to the middle of the Moon and disappeared. The fact that they are present near the lunar surface again implies a very rigid lunar crust. Could they be remnants of the impacting objects that long ago produced the maria in the first place? This was one theory considered for awhile, until it was realized that under virtually any impact scenario, the impacting object would be shattered and vaporized upon collision. Whatever they are, the mascons have mystified astronomers and planetary geologists since the days of the Apollo Program when they were discovered. An entire book could be written on the strangeness of the Moon. Suffice it to say that the story told by the lunar surface is one of catastrophic bombardment on a massive scale. It is estimated that there are on the visible face of the Moon more than 300,000 craters greater than half a mile in diameter, while on the lunar backside the craters number more than a million. Due to the Earth’s larger cross sectional area (almost 4 times the diameter of the Moon) and given the greater gravitational attraction of the Earth, it is conservatively estimated that the Earth should have been bombarded at least twenty times more than the Moon. I will leave it to the reader to ponder the implications of this fact in regards to the Earth’s own catastrophic history. 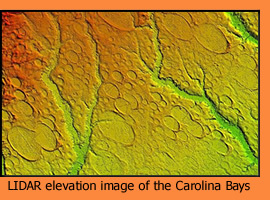 The Carolina Bays are a series of shallow elliptical surface depressions found on the coastal plain region of the southeastern U.S. primarily in North and South Carolina (hence the name) but also in Georgia, Florida and Virginia. What makes these features unique are not only their virtually perfect elliptical shape but also the striking parallel alignment of the long axes of the ellipses in a northwest-southeast direction. While their peculiar characteristics had been noted in the late 19th century, it was not until the advent of aerial surveys in the 1930’s that their precise alignment was recognized. The impression gleaned by these first observers was that a force impinging upon the landscape from above must have been responsible for their creation. This led to the idea of simultaneous multiple meteor strikes or perhaps the debris from an exploding comet nucleus. For several decades a controversy raged in the geological literature between those who advocated a cosmic origin against those who believed more protracted and typical geological processes were responsible. With the death of several of the major protagonists in the 1950’s the controversy was temporarily abated. However, new discoveries promise to rekindle the debate over the origin of these truly remarkable features.